One of my favourite ingredients is lemon! I have been craving lemon cupcakes for a while and knowing that my family will want to take advantage of my Baking skills I decided to wait and bake them when I would be in Greece. 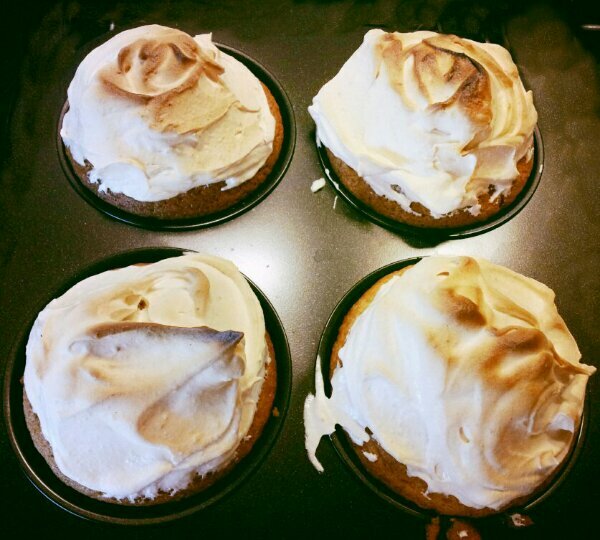 Due to my love and trust in Hummingbird Bakery recipes I decided to look up for their version of lemon cupcakes. After searching when I saw the word meringue on the title I panicked as I know how high the chances for meringue failure are. As I was going through the recipe I felt I was being asked to accept a bigger challenge since some of the details seemed wrong. I had to double and triple check online for meringue recipes and I realised that all of them were identical. The following recipe is the mixture of the recipes I looked into and I highly recommend it! We beat the butter and the sugar until we get a fluffy mixture. We add the eggs one by one and we continue beating in the mixer on high speed for about 5 minutes. In a separate bowl we mix the flour, baking powder and salt. We add into the butter mixture one quarter of the flour mixture and one quarter of the milk. We continue beating until all the ingredients mix well. We repeat the process for every quarter of flour mixture and milk. Finally we add the lemon Zest dn vanilla essence. We pour the mixture in the muffin trays after we have laid cupcake cups. We preheat the oven at 180 C and we bake for about 20-25 minutes or until golden. Now onto the scary part. While the cupcakes are in the oven we prepare the meringue. We beat the eggs in the mixer on high speed until they turn into a solid meringue former. The mixer bowl we will use has to be clean and completely dry. We pour the caster sugar in a separate pan and we just about cover it with water. We bring the mixture to boil and when it starts to thicken, being careful not to overboil it and let it get a brown colour as that will make it turn bitter, we switch on the mixer on high speed and as it is boiling hot we pour the caramel into the beaten egg whites. We continue beating until the mixture starts to cool down. We remove the cupcakes from the oven and wait until they cool down. With a spoon we create a small hole on the top of the cupcake and we fill with 1/2tsp lemon curd. At the end we decorate with the meringue. Once decorated we place the cupcakes on the highest rack of the oven and having turned on the grill on maximum we wait until the top gets burned a bit and then we remove from the oven. Our cupcakes are ready to enjoy!